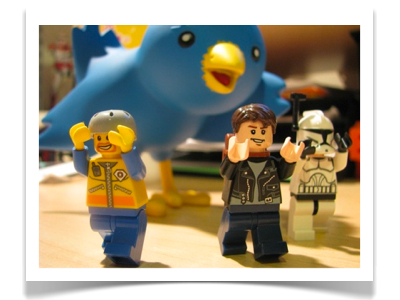 Does it seem like every post about social media in events talks about Facebook and Twitter? Do you feel like your creativity is being constrained, because so many people are talking about the same 3-4 solutions? In a followup to my last post (Real World Likes – The Next Big Thing in Social Media in Events), I want to show you two fresh examples that will help you open your mind to new possibilities for social media at your events. See how Asics used videos and location based tracking to help family and friends at home cheer on their marathoners. This is really cool stuff. Fans record videos and leave messages for runners. Then as the runners go past a checkpoint, the videos and messages play on large screens. Attendees: What is in Your Social Media Toolkit? 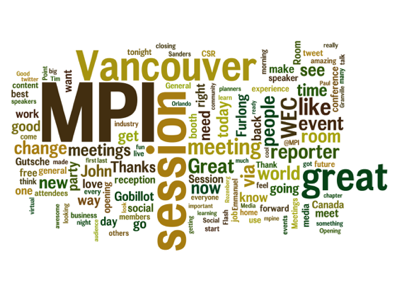 Recently, I was selected to be one of the MPI Social Media Guru’s for the Meeting Professionals International World Education Conference in Vancouver. The video immediately prompted questions about what I am bringing to participate in Social Media onsite. So, here is a list of what I am packing for the event. The iphone has a camera, video camera, wifi capability, auto-upload to YouTube and photo editing software. plus a number of social apps. I plan to use my phone for most of my on-the-spot content capture and creation that will occur in the hallway conversations and during meals. Expect to see tons of photos and videos from me. All via the iphone. I can type like a world champion with the keyboard and film short videos with the built-in webcam. I can edit movies, write power tweets, schedule tweets, write/publish blog posts and podcast. I will use the Macbook Pro during sessions to write and respond to tweets – because I type to slow on my iphone 3GS. Apple makes great products – but they never have enough battery power. To keep myself plugged-in to the content, I will carry a powerstrip and an extension cord around with me. Mike McAllen and I plan to record a few editions of our Going Digital Podcast. So, I will bring along my headphones with microphone to make sure that I am ready to record a show in the hallways or on the Expo floor. While I am mostly digital, I still like to use paper and pen to frame up ideas or solidify my understanding of interesting concepts. So, I plan to have a pad of paper and pencil in my bag as well. In my opinion, these tools will be more than sufficient to engage with you all of the on-site and remote attendees via Social Media. What do you have in your Social Media Toolkit? Is there anything else that you recommend? Are You Ready for Social Media in the New Event World? A few months ago, I was asked to contribute to a research report on Social Media in events. The researcher was looking for insight on social media in events across several different dimensions – technology tools, event strategy, event design, co-creation, collaboration, etc. Talking about the report, Eric Lukazewski said, “we’ll continue to see an evolving event world with accelerated change and technology will forevermore be one of these primary factors.” This report helps all event professionals understand the new opportunities that social media brings to the table for marketing and expanding their own events. 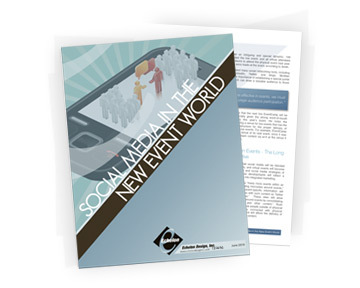 Download the Free Report: Social Media in the New Event World. I created this video as a thought starter for the “Integrating Social Media in Events” Fishbowl discussion that I led at Event Camp. Due to popular demand, I have been asked to share this video with you. I hope that you enjoy it! > Are Your Events Haunted By The Blackberry Prayer? > Do You Allocate Enough Time For Interaction? Right now the digital world and face-to-face worlds are colliding. I think this collision will create new opportunities for events. As attendees become more comfortable with these two way experiences in their own lives – they are going to start demanding similar experiences from you. Maybe they already are? If you have experienced any interesting applications of Social Media or Event Technology during an event – please share your stories. I would love to hear what you think is working or not working in your events.